We are manufacturing CNC Live centre , CNC Live Centre Extended Point & Basco CNC Revolving Center High Speed. Prices are variable as per the product specifications. Description • Made of Hardened and Ground high Carbon Steel. • Hardness 55 to 62 HRC. • Consists of two 'anti-friction' Bearings. • Single Row Deep groove ball bearing and Taper Roller bearing to absorb combined radial and thrust loads. - Consists of Three anti-friction Steel bearings Lubricated and Protected against contaminants and coolants. - Two deep groove ball bearing and one Taper Roller bearing for combined loads. 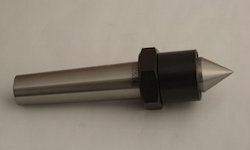 Hardened and Ground (60-62 HRC) Steel with 60A Degree tip angle. Knurled body for a firm grip. Run out within .0002" (.005 mm). Bearings are Pre-loaded and pressed to avoid starting loads. 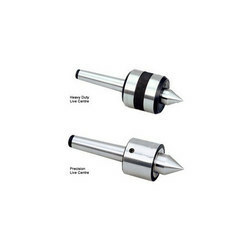 Revolving center is used in CNC or other have machines, it gives better performance at high RPM rotation.